Gallatin, TN – Government contracts come in all shapes and sizes – and sometimes for services you might not expect. Stevens Historical Research Associates is a full-service historical research consulting firm based in Boise, Idaho that specializes in documenting the past through research and writing, working in a myriad of archival facilities and producing expert reports, books, documentary scripts, cultural resource surveys, maps, and many other products. 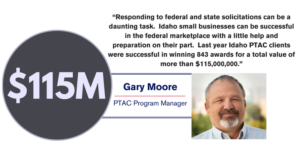 They approached the Idaho PTAC for help understanding the world of government contracting and finding contract opportunities for historical and cultural research activities across the government marketplace. The PTAC was particularly supportive of their efforts to secure a contract with the US Forest Service to research the history of Civilian Conservation Corps (CCC) projects in the Custer and Gallitin National Forests – through multiple iterations of the solicitation and their proposal. “The Idaho PTAC helped us to understand the complicated language of the contract and reviewed our proposal. . . . Their help with this particular contract and their help in navigating through the changes to SAM.gov were invaluable and resulted in Stevens Historical Research Associates being awarded our first every federal contract this August,” writes Stevens Historian HannaLore Hein. On Wednesday, September 26, 2018, National PTAC Day activities across the country will celebrate successful PTAC clients like Stevens Historical Research Associates – as well as the dedicated PTAC professionals like those at the Idaho PTAC. The webinar is free and open to all, providing a taste of the first-rate guidance that PTACs can offer, all at little or no charge to business owners. We hope you will join us for this exciting event. Or find your own local PTAC to see what events they have on tap for National PTAC Day. Just join the celebration!